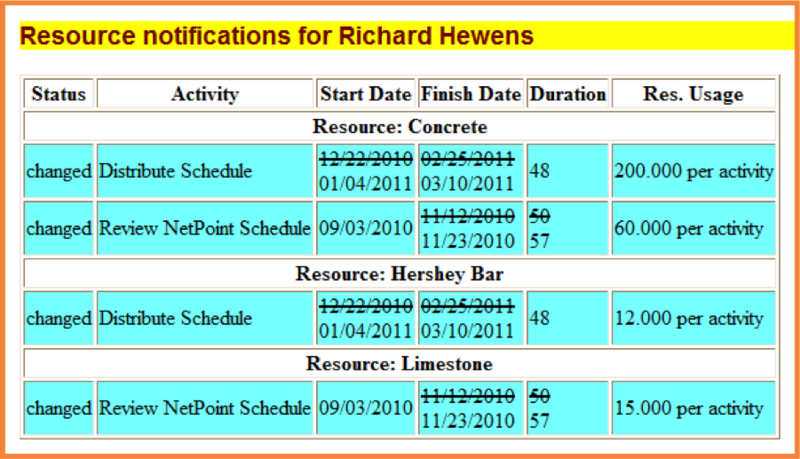 NetPoint has the capability to send email notifications to designated users regarding changes in resource consumption. These notifications may be sent using HTML (recommended) or in TEXT (provided to allow reading on devices which do not support HTML formatting). Before this feature can be used, a list of potential recipients must be created. For each recipient, a full name, email address, and email format must be specified. To define email recipients, click Tools > Manage Notification Recipients… from the menu bar. The Project Members window opens. 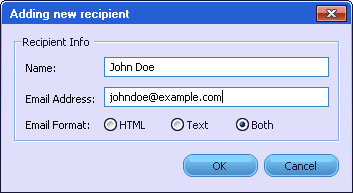 The Recipient Info window opens with the following fields. Enter a person in the Name field. This field is required. 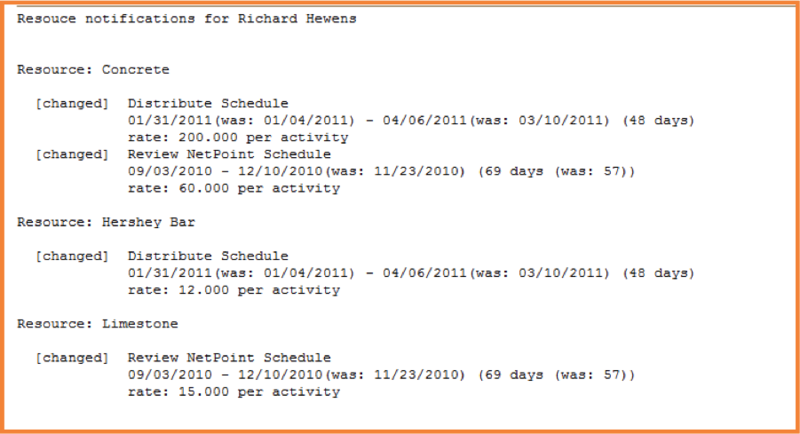 NetPoint will only check for a valid format. As a result, be sure to enter the Email Address correctly. This field determines the format of the email message sent. HTML is the recommended format. Text should only be used when the email client does not support HTML. Choosing Both creates a message containing both formats, and allows the email client to determine which format should be displayed. After entering in the fields, click the Add button. The new recipient will be added to the Project Members window and the Recipient Info window will reset. Additional recipients may be defined consecutively by repeating the steps above. When finished, click the Exit icon to close the Recipient Info window. NOTE: The Add button must be clicked each time to define a recipient before clicking the Exit icon . Otherwise, the recipient will not be saved to the List. To modify a recipient that has already been defined, click Tools > Manage Notification Recipients… from the menu bar. The Project Members window opens. 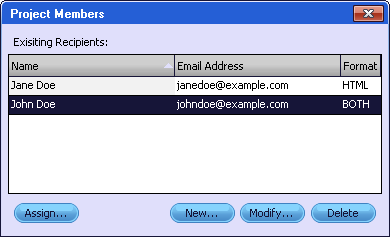 Select a recipient from the list of Existing Recipients. At this point, the Modify… and Delete buttons become enabled. 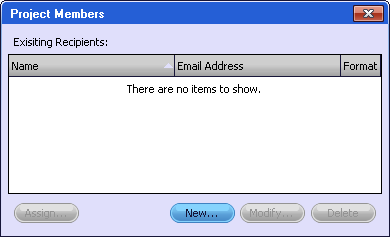 The Recipient Info window opens, showing the several info fields filled in accordingly. After making any changes, click the Update button and the Recipient Info window will reset. Click the Exit icon to close the Recipient Info window. NOTE: The Update button must be clicked before clicking the Exit icon . Otherwise, the change will not be saved. To delete any recipient, open the Project Members window, select a recipient from the list of Existing Recipients, and click the Delete button. Click the Exit icon to close the Project Members window. Assigning resources to recipients is a way to designate an individual recipient responsible for tracking its usage. To assign resources to individual recipients, click Tools > Manage Notification Recipients… from the menu bar. TheProject Members window opens. Select a recipient and click the Assign… button. The Assign Resources to Recipients window opens. All existing resources will be listed, grouped by resource category, even if they haven’t been assigned to any activities yet. Resource categories may be minimized by clicking their title. Any resources already assigned to the selected recipient will contain a check. 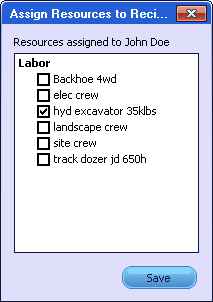 To assign or unassign resources, check or uncheck their boxes respectively. When finished, click Save to save and close the window. To generate and email resource notifications, click Tools > Generate Resource Change emails… from the menu bar. The Send Notification Emails window opens. The name and email of the sender will be filled in by default. They may be changed, if desired. When finished, click Send. All recipients assigned resources will get an email. There have been no changes since the last email.